The Russians were stubborn and determined to defend International Communism and their Motherland. By the time the Germans destroyed their pre-war army, they’d built another, and when the Germans destroyed that too, they built yet another! These forces weren’t well trained, weren’t skilfully handled, and suffered horrendous casualties, but they were successful in first stopping the German invaders, and then in throwing them back. A force from Enemy at the Gates reflects this ‘sledgehammer’ approach, combining large numbers and powerful weapons to bludgeon your opponent into submission. 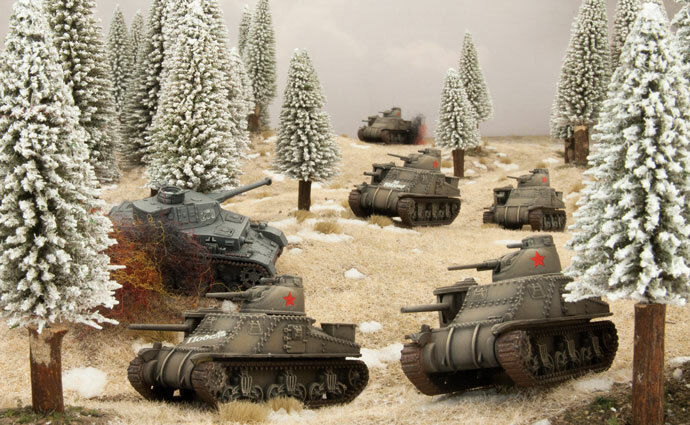 Enemy at the Gates has three types of tank formation: the T-34 Tank Battalion, the Mixed Tank Battalion, and the M3 Lee Tank Battalion. As one might expect from an army with a shortage of trained and experienced officers, the Red Army’s leaders tended to keep a tighter control on their subordinates than Western armies. 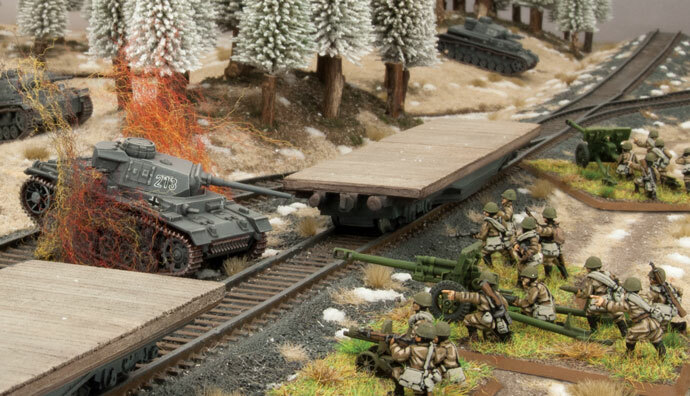 Flames Of War reflects this by stepping things up a level. Soviet Formations are small battalions (rather than the large companies of Western armies), and Soviet Units are small companies (rather than platoons). As the Germans approached Stalingrad, the Red Army started turning out brigades entirely equipped with the T-34 tank, the only type produced in Stalingrad. You can build this formation as a T-34 Tank Battalion with an HQ of one tank and two huge units of up to ten T-34 each! While the Red Army considers the T-34 to be a medium tank, it is about as fast as the British Crusader or American M3 Stuart light tanks, has more armour than the American Sherman medium tank, and a main gun better than that on the German Panzer III. That’s a lot to pack into a tank, so the Soviet designers had to take a few shortcuts. The T-34 has a small, two-man turret where the gunner also commanded the tank, and an inability to see and avoid obstacles that leaves it with a fairly average Cross rating, even though it has really wide tracks. The T-34 also suffers from the inexperience of its crews — the average Soviet tank battalion in 1942 was destroyed in battle a little more than a month after it was created! This means that they are hit on a roll of 2+ as the crews have little ability to make use of terrain or cover. Fortunately, they don’t suffer too badly from this as their speed and armour tends to protect them until they get into a firing position, then the sheer number of powerful guns firing finishes the job. If the T-34 isn’t tough enough for you, you’ll want to field a Mixed Tank Battalion with a mix of heavy KV-1, medium T-34, and light tanks. The Red Army set up these oddly-structured units to replace the tank divisions they lost at the start of the war. The new structure was small enough that relatively inexperienced officers could lead them successfully, and gave everyone a little bit of everything to keep resource allocation simple. The first thing you notice is that this formation does not have a formation commander. There is no HQ! This is because the few officers that the Red Army had with enough experience for the role were too valuable to lose by leading from the front. The KV-1 comes in two varieties, the original KV-1 and the lighter (comparatively), faster KV-1s. A Mixed Tank Battalion has up to five of these monsters. The basic KV-1 is impressive, with the same armour as a Tiger tank and the same 76mm gun as the T-34. It’s slow (it even makes the British Churchill tank look sprightly! ), but well-nigh unstoppable. It’s fortunate that the KV-1 is so tough, as its inexperienced crews are rated as Reckless, so are hit on a roll of 2+. The KV-1s was built as a faster version of the KV-1, so it sacrifices some armour (but is still one of the best armoured tanks in the game) to be able to move faster than a Panzer III or Sherman and cross almost any obstacle with ease. It also has a better laid out turret with a cupola, removing the Overworked penalty (+1 to hit when shooting on the move) that the basic KV-1 has. The T-34 is the middleweight component of the formation. Fast, well armoured, and with an effective gun. A Mixed Tank Battalion has up to 10 T-34 medium tanks. The Mixed Tank Battalion also has up to 10 light tanks. These can be the Valentines or T-60 tanks as in the T-34 Tank Battalion, or they can be the speedy American M3 Stuart light tank. This tank gives you a third style of light tank. While the Valentine is well armoured, but slow, the M3 Stuart is really fast, has a similar gun to the Valentine. 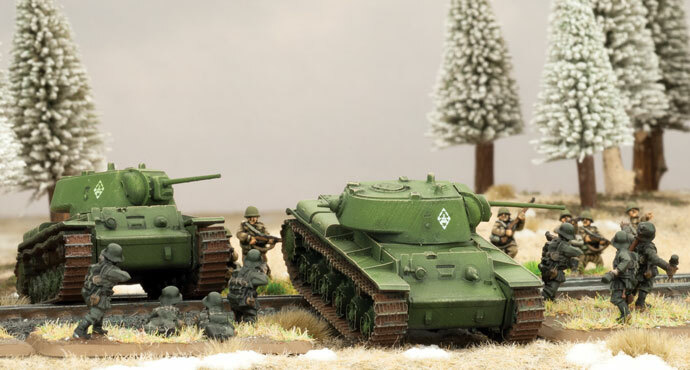 Like the T-34 Tank Battalion, the Mixed Tank Battalion can field a submachine-gun company and an 82mm mortar company to handle problems that the tanks aren’t suited to. The United States supplied the Soviet Union with 1400 M3 Lee medium tanks. These were formed into tank battalions organised much like the T-34 battalions, with companies of M3 Lee medium tanks supported by companies of M3 Stuart light tanks. The M3 Lee provides a cheaper alternative to the T-34. It mounts a 75mm gun of similar performance to the Soviet 76mm (although it is in a limited-traverse hull mounting rather than in the turret), but has lighter armour and less speed. To compensate for this, its huge crew (seven men compared with the four in a T-34) eliminate the problem with overworked crew that the T-34 has, and allows it to mount a 37mm gun in a rotating turret as a secondary weapon. The later versions of the M3 Lee mount a longer, more powerful 75mm gun that had better anti-tank capability. The M3 Lee Tank Battalion is a colourful option that trades speed and protection for a little more hitting power. Enemy at the Gates has two types of infantry formation: the large Rifle Battalion and the reduced-strength Hero Rifle Battalion. A Soviet Rifle Battalion is a large formation. Not only does it have three rifle companies, but it also has SMG companies, Maksim HMG companies, anti-tank companies armed with PTRD anti-tank rifles, 45mm guns, and 76mm guns, mortar companies with 82mm and 120mm mortars, scout platoons, and snipers available to back them up. Your formation is a mini army in its own right. The Rifle Company is a very different sort of unit. At full strength it has 28 infantry teams, two HMG teams, two powerful PTRD AT rifle teams, a 50mm light mortar team, two flame-thrower teams, and a Komissar team — an awesome steamroller in its own right! I’m not sure which is more nerve wracking, watching this horde rolling towards you while praying that you can kill enough before it hits, or watching your troops ploughing into the enemy fire while paying that enough will survive to make an effective assault! One thing that helps your troops close with the enemy is the company’s Komissar team. While the Komissar is alive (don’t forget to use Mistaken Target to keep him going), your unit has their Morale rating improved from Confident to Fearless. Throw the battalion’s Formation Commander into the mix, and you should manage to avoid staying Pinned Down from the massed fire that will be pouring into your units. If you want an even more effective Komissar, the Smersh! (Death to Spies!) command card improves the unit’s Morale rating even further, at the cost of destroying one of your own teams every time you roll a 1! A Rifle Battalion may replace one of its Rifle Companies with a Penal Company of convicts seeking redemption with their blood. This unit charges out ahead of your assault to draw enemy fire. It has a variant on the Spearhead rule allowing it to start the game in No Man’s Land, closer to the enemy. As it cannot ever dig in or make use of bulletproof cover, its best bet is to charge the enemy as fast as possible. Knowing that their choices are to do or to die makes a Penal Company hard to stop. They are rated as Fearless 3+, but this improves to 2+ while their Komissar team is with them. The Penal Company won't cost you any Victory Points if they die. As well as Rifle and Penal Companies, your Rifle Battalion can field a pair of SMG Companies. These are smaller than Rifle Companies, and lack the specialist weapons (although they can still have flame-throwers), but they have ROF 3 (whether moving or not). Combine this with an Assault rating of 3+, and they are your premier assault troops. Your Rifle Company can have a Scout and a Sniper Platoon for extra sneakiness. 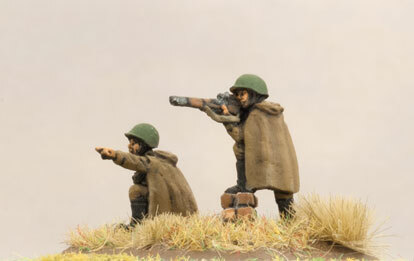 The Scout Platoon is a smallish (5-9 teams) platoon of submachine-gunners that specialise in sneaking about. Their Spearhead special rule is useful for getting your riflemen or supporting weapons into position. Once they’ve done that little chore, they can be sent on sneaky missions of their own. They are rated as Careful so are hit on 4+, and have the Scout special rule, so are hard to hit if they stick to cover and don’t shoot (you’ll need at least a 6 to hit them!). They’re Fearless and have a Tactics rating of 3+, so can be relied on to get their mission done, so long as it doesn’t involve heavy fighting. Being scouts, they don’t like getting into assaults! The Sniper Platoon is also very sneaky. It contains up to four independent sniper teams. 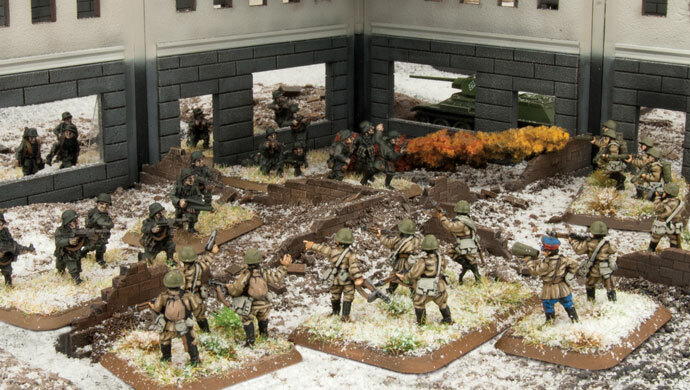 These men and women (many Soviet snipers were women) pop out of cover anywhere on the table apart from the enemy deployment area, then proceed to cause well-aimed havoc. The enemy can’t use Mistaken Target to move a sniper’s hit, and a single hit from a sniper will Pin Down the enemy! Rifle Battalions take horrendous casualties, so after a battle or two, there are only a handful of heroes left to carry on the fight. A Hero Rifle Battalion has all the elements of a Rifle Battalion (although not as many of everything as they once had!). The most obvious difference is in the Rifle and Submachine-gun Companies — they are much smaller, only ten teams strong at most, and have a Morale rating of Reluctant 5+, improving to 4+ with a Komissar, but have a Save of 3+. Basically, if you’ve survived having most of your unit wiped out, you’re better at surviving, but not as eager to risk your life! Oh, and they don’t get the Urrah! Special rule — no suicidal charges for these lads. Hero Rifle Battalions can’t field Penal Companies, but get a Storm Group instead. This is like a small submachine-gun company made up of hand-picked veterans, backed up with plenty of specialist weapons. The unit is Fearless 3+, Careful (is hit on 4+), and has an Assault rating of 2+ thanks to their experience and lethal submachine-guns. This unit is ideal for city fighting where individual buildings need to be assaulted and held. These formations have a wide variety of interesting support options, ranging from flame-tanks to salvo rocket launchers. The Soviet Union built flame-thrower versions of both the T-34 and KV-1. The KV-8 flame-tank was a KV-1 with a flame-thrower in place of the turret machine-gun, and the main gun replaced with a 45mm gun to make space. Like the KV-1, the KV-8 is slow and massively armoured. It’s flame-thrower has ROF 5, making it lethal. The OT-34 is less specialised, being as fast as a normal T-34, and mounting the same 76mm gun. Instead of a turret-mounted flame-thrower, it replaces the bow machine-gun (and the bow machine-gunner!) with a fixed flame-thrower operated by the driver. As a result, it’s ROF is 3. Like flame-tanks, the Soviet Union were early adopters of rocket technology. The Katyusha salvo rocket launcher is a truck-mounted rocket launcher that saturates a huge area with explosives when it fires. Instead of the normal 6”/15cm-square Artillery Template, it uses as 10”/25cm-square Salvo Template, hitting nearly three times the area of conventional artillery! Being an elite Guards unit, a Katyusha Guards Rocket Battery has a Skill rating of 4+, giving them the ability to range in quickly when engaging new targets. The Soviet Union also has plenty of conventional artillery as well. Their 76mm Artillery Battery uses the same weapon as the 76mm Anti-tank Company, they can fire artillery bombardments, it has a Save of 4+ rather than 3+. While the 76mm guns are great light artillery (equivalent to the British 25 pdr), they are also quite mobile if you want to roll them up and blow away the enemy over open sights. The 122mm howitzer is the equivalent of the German 10.5cm howitzer, so has more punch as artillery, but a little less versatility for direct fire or anti-tank work. The third option is the Rifle Battalion’s 120mm Mortar Company. It has no direct-fire capability, but it delivers a similar punch to the 122mm howitzer for less points. While the Katyusha, 76mm, and 122mm options are all 8 points for 4 weapons, the 120mm mortars are 6 points for 6 weapons (or 8 points for 8 if you want some redundancy!). Moving back to elite units, we have the Tank-killer Companies. These have the same 45mm and 76mm guns as the Rifle Battalion’s Anti-tank Companies, along with a really nasty long-barrelled 57mm gun, but are hand-picked troops. Their unofficial mottos are ‘double pay — triple death’ and ‘a long gun, a large salary, and a short life’! They are as skilled as any anti-tank gunners, rated as Fearless 3+ for Motivation and are hit on Careful 4+, so they tend to survive well and fight to the last. The Red Army’s air support comes from the Il-2 Shturmovik. Heavily armoured, this aircraft is hard to shoot down. It’s hit on 4+, rather than 5+ like most aircraft, but has a Save of 2+, rather than 3+. It can fly through almost any anti-aircraft fire to deliver its attacks. Those attacks can be devastating as it has 23mm cannon with Anti-tank 6 against Side armour, and a variety of bombs and rockets that give it Anti-tank 5 against Top armour. 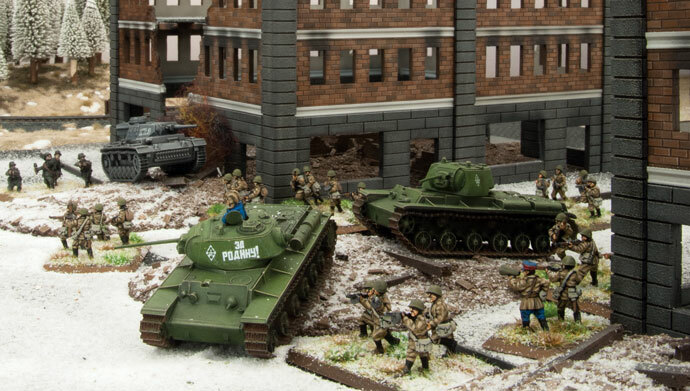 As well as a rich variety of tanks, infantry and supporting weapons for the Red Army, Enemy at the Gates also has a section on city fighting to go with Battlefront’s new plastic city buildings. This section tells you how to use the city buildings on a conventional table, and has a set of simplified building rules for use in a dense city environment. 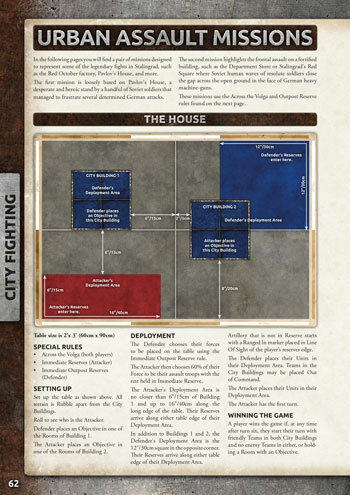 There are two missions in the book: The House and The Square, that use these rules to pit two infantry forces in a close-quarters fight (the table is just 2’x3’ or 60cm x 90cm) for a pair of these city buildings. The companion German book, Iron Cross, gives another pair of missions as well. Each of these can be played in an hour and recreate the feeling of the desperate fighting in Stalingrad. 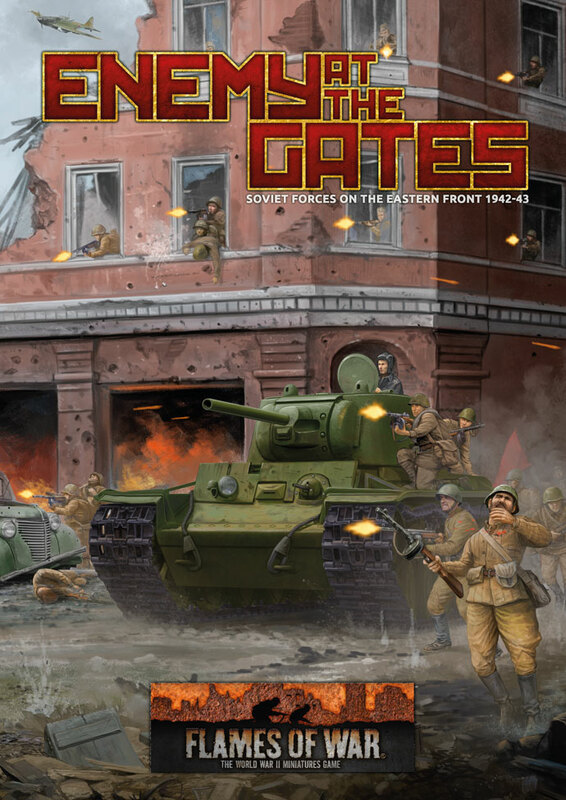 Enemy at the Gates is Here!